Macadamia Nut (Macadamia Spp) other names: Australian Nut, Bopple Nut, Bush Nut, Huile de Macadamia, Macadamia integrifolia, Macadamia Oil, Macadamia tetraphylla, Noix d’Australie, Noix Macadamia, Noix de Macadam, Noix de Macadamia, Noix de Queensland, Noyer du Queensland, Nuez de Macadamia, Queensland Nut. 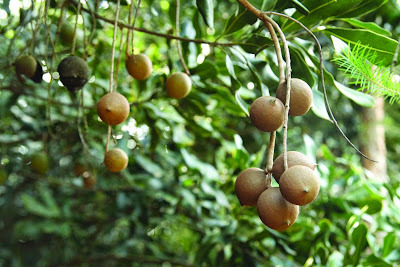 Macadamia nut is the seed of the macadamia tree. Macadamia nuts are native to Australia. They are grown commercially in Hawaii and, to a much smaller extent, in California and Florida. Macadamia trees, belonging to the plant family Proteaceae, are known by various names, including nut oak, Queensland nut or bauple nut. Macadamia is a genus comprising four species and has its origin in south eastern and central Queensland as well as north eastern New South Wales in Australia. Commercially, macadamias are important for their fruit, which is also known as macadamia nut or just macadamia. Macadamia trees are evergreen species that have small to large growth varying from 2 meters to 12 meters (6.6 feet to 39.4 feet). These leaves of these trees are appear in whorls of anything between three and six and measure about 6 cm to 30 cm in length, and 2 cm to 13 cm in width. The shape of the macadamia leaves varies from obovate to elliptical and their entire margin is either serrated or spiny. The flowers of macadamias appear in an elongated, thin, simple raceme measuring anything between 5 cm and 30 cm in length, while the individual flowers are just 10 mm to 15 mm in length. The flowers have four tepals and come in a number of hues - white, pink or purple. The fruit of macadamias is extremely hard, wooded and globose follicle having a sharp apex. The fruits generally contain one or two seeds. In 1857, a German-Australian botanist named Ferdinand von Mueller named the plant macadamia to honour his colleague John Macadam, who is said to be the first to describe the plants of this genus. Indigenous to the Australian continent, macadamia nuts are not only flavourful, but also contain various nutrients. Currently, macadamia trees have been naturalized in Hawaii and are also being cultivated there. 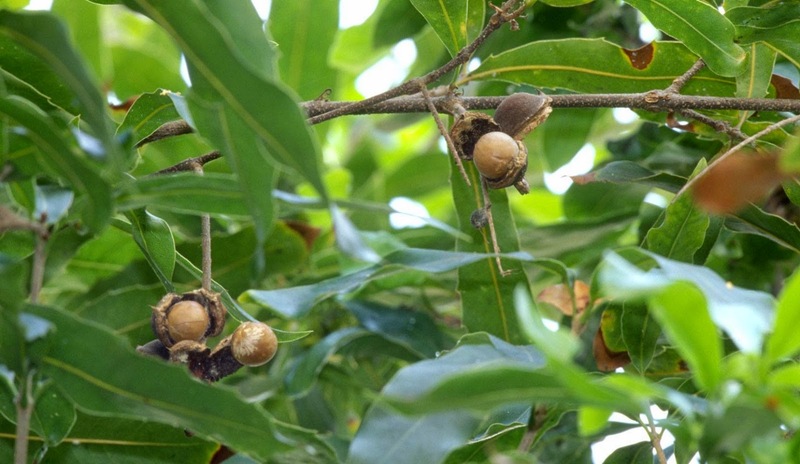 For the native Australians, macadamia nuts, which are locally known as Kindal Kindal nuts or Jindilli, formed a vital conventional food source. Mostly, macadamia nuts are sold as shelled nuts and, hence, they need to be stored properly with a view to prevent them from turning rancid. People have been cultivating the macadamia trees for over a century now, especially for their food value. Over the years, many farmers have produced different macadamia cultivars, each having its individual attributes, like especially large nuts or very flavourful nuts. Macadamia nuts develop in very tough kernels that are really difficult to rupture. In fact, this is one reason for macadamia nuts being so expensive - it is not only an arduous, but also challenging task to shell these nuts. When the shells are cracked open, an ivory-hued kernel comes to the view. 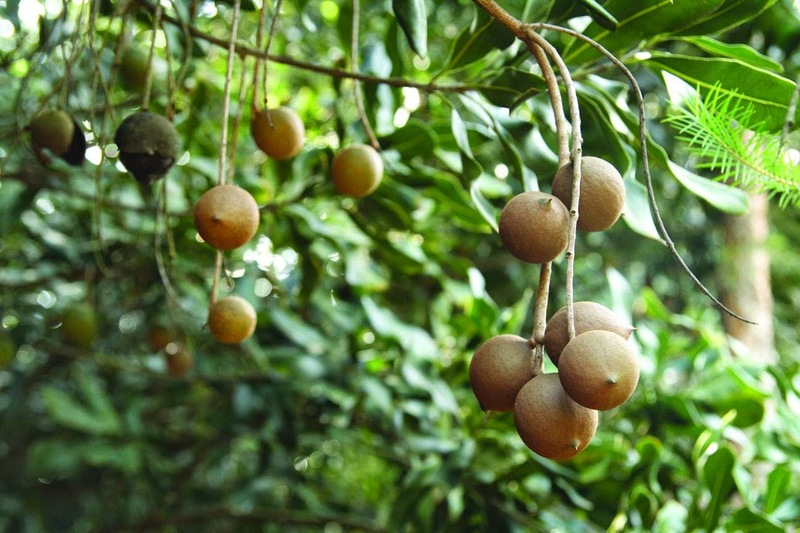 The macadamia kernel contains high concentration of oil having a butter-like, creamy flavour. Macadamia nuts can be consumed raw or roasted out of hand. Alternatively, they can be pounded to produce nut butter. Many people use these nuts together with white chocolate in confectionery items. In addition, macadamia nuts can also be used in desserts and are often found in various nut mixes. Since macadamia nut encloses high levels of fat, it is advisable that the shelled nuts should be stored in a refrigerator to ensure that they have the longest shelf life. When stored in room temperature, macadamia nuts may possibly become rancid soon. In any case, it is better to use them fresh or quickly, as fresh macadamia nuts usually taste better. Macadamia trees thrive in full sun. However, they can also benefit from partial shade when grown in places having hot climatic conditions. These trees should never be grown in windy locations. The branches of macadamia trees are very fragile and can be broken by strong winds, particularly when they are overloaded with a good crop of nuts. Macadamia trees possess the aptitude to endure a variety of soil types ranging from open sandy soils to soils composed of lava rock to intense clay soils, provided the drainage system is excellent. However, macadamias thrive best in deep, fertile soils having a pH between 5.5 and 6.5. It is important to note that these trees cannot endure water or soil having elevated salt concentrations. Therefore, it is necessary to leach the soil on a regular basis in places when the annual rainfall is low. Roasted macadamia nuts are a popular snack. But some people also use macadamia nuts as medicine to lower high cholesterol. Eating macadamia nuts as part of a healthy diet seems to lower total and “bad” low-density lipoprotein (LDL) cholesterol, and to raise high-density lipoprotein (HDL) cholesterol. But the changes aren’t huge. Macadamia nuts are high in nutrient content, but do not contain any cholesterol, making them an ideal health food. Since these nuts are 100 percent cholesterol free, they are extremely helpful in reducing the blood cholesterol levels. Macadamias contain elevated amounts of monounsaturated fats, which are not only good for our overall health, but also protect the cardiovascular system by lowering the cholesterol levels and keeping the arteries free from plaque build-up. The nuts of macadamia trees are also effective in reducing the type of fats called triglycerides, thereby lessening the chances of developing coronary disease. Apart from the above mentioned attributes of macadamia nuts, they also enclose elevated concentrations of vitamin B6 and vitamin B1, also known as thiamine. These outstanding nutrients provide a number of health benefits, including effectual carbohydrate metabolism, encouraging growth, lessening stress and inhibiting the cells’ aging process. In addition, vitamin B1 is also useful for the health of our heart and strengthening the immune system. As macadamia nuts contain significant levels of B complex vitamins, they are effective in facilitating the movement of ingested foods through the digestive tract as well as improving the metabolic processes. Macadamias also possess potent antioxidant attributes that are useful in lessening the chances of developing specific forms of cancer, such as cervical, breast, lung, stomach, gastrointestinal (GI), and prostate cancers. In addition, macadamia nuts are useful for developing strong teeth and bones, keeping the balance of the fluids in the body in check, encouraging release of energy and also bone growth. Iron contained in macadamia nuts is necessary for the appropriate functioning of the red blood cells (erythrocytes) and promoting enzyme activities. Macadamia nuts also contain sufficient amounts of monounsaturated fats, which are effective in reducing the levels of blood cholesterol, thereby diminishing the chances of developing stroke and heart disease. Significant amount of protein is also found in macadamia nuts. Proteins are necessary for the health of muscles, connective tissues, hairs and nails. In addition, protein also promotes blood formation. Macadamias also help to develop a healthy nervous system, in addition to ensuring a healthy skin. Consuming these nuts promotes new tissue growth, while diminishing birth defects. Taking a diet containing adequate amount of macadamia nuts regularly encourages overall good health, increases the life span and helps to decrease the occurrence of degenerative ailments. All these apart, it has also been found that consumption of macadamia nuts helps to lessen the chances of developing cardiovascular diseases, anti-aggregatory disease, anti-inflammatory diseases as well as immuno-modulating diseases. As macadamia nuts enclose elevated levels of dietary fiber, they are helpful in encouraging a feeling of being satiated, providing roughage, inhibiting digestion as well as reducing the craving for food, lessening constipation, encouraging the growth of beneficial bacteria in the intestines, reducing diverticular diseases, lessening the risks of irritable bowel syndrome (IBS), bowel cancer in addition to reducing hemorrhoids. Macadamia nuts enclose rich amounts of various phytonutrients, which are helpful for the immune system. These phytonutrients are vital for perking up as well as strengthening this vital mechanism of our body. Macadamia nuts are safe as food, and they seem to be safe as medicine for most people. They can cause an allergy, but this is rare. While macadamia nuts offer several health benefits, they should be used with caution. Consumption of these nuts results in a condition called macadamia nut allergy. However, this condition is rare and does not occur as frequently as different allergies caused by consumption of other nuts like pistachios and cashew. Nevertheless, consumption of macadamias may sometimes be the reason for hypersensitivity reactions, especially in people who are sensitive to foods prepared using macadamia nuts. 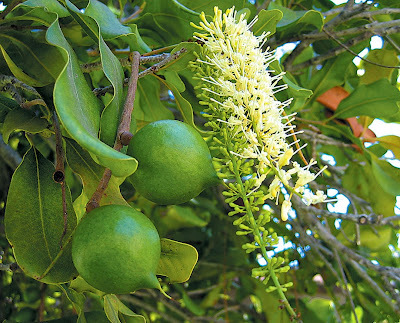 The symptoms of macadamia nut allergy may differ from gastro-intestinal problems such as vomiting, nausea, diarrhea, abdominal pain and even problems related to the respiratory tract such as breathing difficulty, swelling of lips, sore throat and chest congestion. Hence, it is important to exercise caution while consuming these nuts, especially people who have nut allergic syndrome when consuming foods prepared with macadamia nuts or their products. Pregnancy and breast-feeding: Macadamia nuts are safe when eaten as food. But it’s not known whether it’s safe to take them in larger medicinal amounts during pregnancy or breast-feeding. Play it safe and stick to food amounts.